Oh goodness, it seems a bit surreal that this thing is finally happening. It feels very weird to write that my book is actually available as of today. And, I just found out it's already been reviewed (there are a couple of other project pictures there), wow. The projects are divided into bags, home, children's projects including toys, bedding and clothing, and adult clothing. My goal was for the projects to simple enough for anyone to sew without being boring, to be pretty, versatile and to be really practical, in other words, projects you would really want to make and use in your every day life. There are lots of full size patterns in a nice envelope at the back of the book. I wanted the book to be really easy to use so nothing in the book needs to be enlarged. To celebrate the release of the book I'm giving away 3 downloadable patterns to anyone who buys the book in the next week. Scroll down to the bottom to see the patterns. I'll be explaining how this will work in the next post. Below are pictures of some of the projects from the book. These pictures didn't work for one reason or another (I took like 3000 or something) but the projects are the same as in the book. I love this picture of the Big Easy Sling project (a great big reversible bag, super easy to make) but it was too dark in the foreground, too light in the background and wouldn't have printed well. I love this picture of the box ottoman taken in wonderful Yvonne's gorgeous house, the prettiest house I've ever seen (owned by one of the loveliest people I've ever met) and the setting for many of the pictures in the book. This is just a variation on a baby blocks project in the kids section of the book but I wanted to present a really easy method to make blocks to any size so they could be used as fun squishy seating for a kids room. My little Ava girl wearing the Juliette blouse project that can be made with short or long sleeves, as dress, or with shirring at the bodice or any combination of these. I wanted to provide a simple pattern the could be used to make lots of variations. This picture was a bit dark and the shirt a bit too washed out to use for the book. This one is the Every Day Tunic. I didn't time it but it is extremely quick and easy to make. I really wanted to include some knit projects in the book because knit is so extremely practical and comfortable. I think this picture is quite lovely but there are a bunch of problems with lighting and focus, ugh again!! There's a good one in the book though. This is a picture from the actual book of the Go-To Top or Dress. The reviewer I mentioned above had it up so figured why not share it here. Again, super simple to make! And finally, these are the three downloadable patterns I'll be giving away to anyone who buys the book this week. More details on that in the next post. I see a huge amount of traffic coming to this post from tumbler and I couldn't resist letting people know that in the next post I have a giveaway of my new fabric collection and new book going on right now. I'd love you to enter!! Just leave a comment in the next post for a chance to win. Thanks for stopping by!! 1. Figure the skirt width. Measure the wearers waist using a tape measure or long string and a ruler. Multiply that number by 2.66, round to the nearest half inch, and then add 8 (for a 6 inch overlap and 2 inch seam allowance). Add 8" to the waist measurement and then multiply by 2.66. 2. Figure the length of the waistband/ties by adding 21 inches to the final skirt width by 2.5" wide. If you need to, It's fine to piece two fabrics together along the short side to achieve the correct length though I wouldn't piece more then two fabrics because you'll get too many noticeable seams. 3. Figure the skirt length. Measure from waist to where you want the skirt to fall. Add 1.25" for hem and seam allowance. 4. Cut your fabric according to these measurements. 5. Make the pleats. First hem the short edges of the skirt. Fold the raw edges to the wrong side by 1/2", press, repeat and topstitch. Along the top raw edge of your fabric use a pencil to make marks 1.5" apart. Use an iron to press pleats in alternating directions at every 1.5" mark and pin in place. 6. Attach the skirt band/tie. With right sides facing place the band/tie, off center so that it will be about 8" longer on one side then the other, on top of the top (pleated) edge of the skirt aligning raw edges. Pin and sew the band/tie to the skirt. Press the raw edge of the band/tie to the wrong side by 1/4" down the entire length. Press the raw edges of the short sides of the ties to the wrong side by 1/2". Fold the band over so that the 1/4" pressed fold covers the raw edges of the seam on the wrong side of the skirt and pin. You are essentially using the band as you would seam binding. Starting in the middle of the skirt, topstitch very close to the folded edge of the the band on the wrong side of the skirt to the end of one tie. Repeat. Press the raw edge of the bottom of the skirt to the wrong side by 1/2". Repeat. Pin and sew to hem. Press the entire skirt to emphasize pleats and get a crisp edge on the top edge of the band. Well, either way I'll have a tutorial up soon. I recently made two wonderful discoveries when the lovely Natalie Osborn, an editor from Crafts Beautiful Magazine, www.crafts-beautiful.com contacted me to let me know she had used my fabric for a lampshade workshop at the beautiful crafting venue Homemade London and had featured the experience in an article for the magazine. I'm a fan of anything that encourages others to explore and express their creativity in new ways and Crafts Beautiful really does that with lots of ideas and inspiration for papercraft, sewing, and jewelry crafting to name a few. I'll be working with Crafts Beautiful on a couple of exciting things in the next few months which I'm thrilled about and as for Homemade London I love the idea of this place. A beautiful environment to learn and craft lots of different kinds of things in one space. I wonder if this is a trend?? I haven't seen anything like it up till now and I'm just loving the idea. This is a super easy way to make a very full, twirly pleated skirt without a zipper and without having to sew the pleats along their length. It's made up of a top band sewn to a pleated skirt. It can be made to any size. I used cotton quilt weight fabric but chorduroy or wool would be great too. 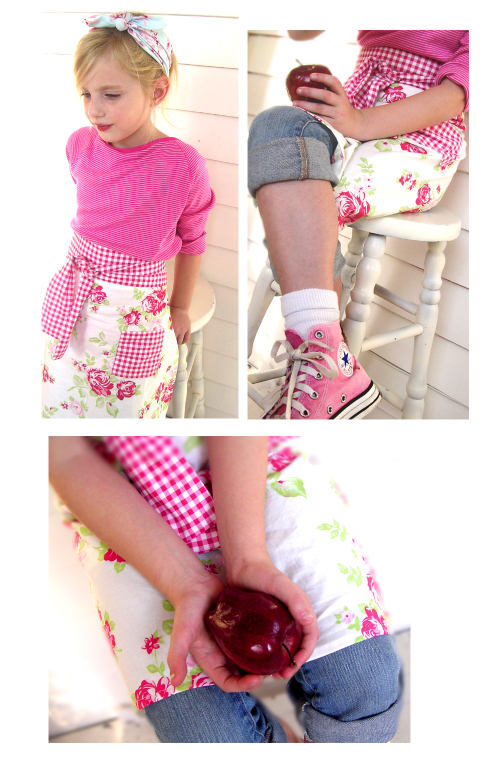 If you're looking for a ruffled skirt tutorial, take a look at this one I did a few years back. And don't foget about the book-link-free pattern promotion in my last post if you haven't seen it yet. 1.Figure the width and length of the front and back pleated portion of the skirt. Measure child around her hips at the widest part. If you don't have a tape measure use a long string and a yardstick to get this measurement. Divide this number by two and then multiply by 2.66. To this number add .5" (for the seam allowance). Round this number to the nearest whole number. This is the final width (un-pleated) of the front and back panels of the pleated portion of the skirt. Example: Hips=30". 30/2 = 15(2.66) = 39.9 + .5 = 40.4. Round to 40". ***Note: this skirt is easy to make smaller if the final size is too big but it can't be made bigger. It wouldn't hurt to add one more inch per panel in addition to the seam allowance and then take it by sewing the side seams if it's too big. To figure out the length, measure from the top of your girls hips, but not her waist as the skirt is meant to sit a bit low, to where you want the skirt to fall. I like it to fall about mid thigh to be worn with leggings or tights. It's best to measure her in back so you can take her backside into account. Subtract 2.75" from this measurement. Cut a rectangle of fabric to the final width and length measurements. 2. On the top raw edge of both the front and back panels make a mark with a pencil every 1.5". Make a pleat every 3" by pulling up at mark A, folding at mark B and pulling A over to meet mark C (see step 2 diagram). Repeat treating the next mark as "A". Press the first couple inches of each pleat with an iron and pin in place. When you get to the end, if there isn't enough fabric left for a full pleat just leave it un pleated. Before proceeding, make sure the front and back panels are the same size after pleating. 3. To make the top band, cut two rectangles of fabric that are as wide as the pleated portion of the skirt and about 6" long. 4. With right sides together sew the band pieces to the top raw edge of the pleated pieces to form the front and back of the skirt (see step 4 diagram) It's easiest to sew this in the direction of the pleats and with the pleats on top. Remove the pins. With right sides together, sew the front of the skirt to the back of the skirt along the sides. At this point, try the skirt on your girl. It should fit easily over her hips without being huge. Take it in along the side seams if it's too big and trim the seam allowances. 5. Make the casing for the elastic. Fold the top raw edge of the skirt to the wrong side (inside of the skirt) by .5" and press. Fold again by 1", press and sew close to the folded edge. Leave about 1" un sewn near one side seam as this is where the elastic will be inserted. 6. Pin the safety pin to the elastic and work the elastic through the opening in the casing around and back to the opening. Try the skirt on your girl one more time and pull the elastic so that it's slightly smaller then the skirt but still comfortable. Cut elastic to this length plus 1". Overlap the ends of the elastic by .5" and sew together. Sew the opening in the casing closed. 7. Hem the skirt. Fold the bottom raw edge of the skirt to the wrong side (inside) by .5", press, repeat and sew close to the folded over edge. So, I have a little promotion going on. I'm offering a free download of one of the two patterns above to anyone who links from their blog, website, facebook or twitter feed to my book, Sew What You Love, on both Barnesandnoble.com and Amazon.com. Just email the links to me at tanya@grandrevivaldesign.com for confirmation and I'll email you the free download link within 24 hours (probably much sooner then that but I might be walking the dog or taking a shower or something). A text link is fine but if you want to use the book cover photo on my right side bar that would be wonderful. Oh and let me know which pattern you'd like to download. Below are a couple of projects from the book. More sneak peaks and details about the book coming soon. Well, I always new I wanted children but I never knew just how much I wanted a dog until we got one. Jacob Marley is a 9 week old Golden Doodle. We saw one a few years ago driving in Manhatten on a cold winter night. A young woman was walking down the street with this great big, deliriously happy looking, bounding, long haired white dog which I recognized as a Golden Doodle as we'd been doing a little bit of research on hypo-allergenic dogs. The dog was too big to be a puppy but acted just like a puppy. At one point it did a sort of back flip and at that point I think our whole family sort of fell in love with the idea of a Golden Doodle. We talked about it for a couple years but with allergic children I just never really believed it was possible, just didn't buy the hypo-allergenic thing because even dogs that shed very little still have dander which is what people with allergies are actually allergic to. And I never thought the hassle and responsibility of owning a dog would be something I'd want to bring to my busy life. To make a longish story short, in one of those "you only live once moments" we drove to the UK and bought Jacob Marley. He has not caused even one sneeze in the two weeks we've had him, despite constant touching, nuzzling, and in general ridiculously affectionate behavior toward him. This dog anyway is hypo-allergenic for us and really sheds very little. Never having had a dog I'm sort of amazed at my feelings of affection for him and just the happiness he has already brought to our family. Watching the bonding process between dog and his people has been really amazing. Even more than that, the way having Jacob has forced me out of my obsessive work routine and for a couple hours each day to just "be there" observing him, playing with him, caring for him, teaching him, and watching him slowly bond to us, has been such a great experience and a change I really needed at this point in my life. "A puppy's life clearly displays what characterizes the whole of life: the mystery of development. The entire universe, it seems, is in a continuous process of growth that extends from before the first moments of each individual existence to the end of life and beyond. Nothing is excluded from this movement, though our own consciousness of its breadth can be dulled by the chaotic pace of modern living.Too often we take this journey for granted, carelessly letting it pass unacknowleged. With our busy lives we can easily grow insensitive to the basic wonder of life, leaving us spiritually impoverished and unhappy. This is perhaps why animals (particularly our dogs) are so important to us and why we benefit from their companionship: they root us in life." My girl Jennifer Paganelli's new book was released yesterday!!!!!!!!!!!!!!!!!!!! I literally can't wait to see it. Jennifer fabrics are truly unique, vibrant, beautiful and eclectic and now, in addition to her wonderful sewing patterns, she's brought her amazing aesthetic to her new book. I'm so happy for you Jen!!!!!!!!!!!!!!!!!!!!! The book will be in all major bookstores. You can order a copy right now here. Or, you can order a signed copy from Jen herself while checking out all the beautiful and inspiring ideas on her blog. I definitely have not been able to sew with Delilah as much as I would have liked. Usually I sew a ton of samples with each collection which is the most exciting part because I get to turn some of the fantasies I had while designing the fabric into reality. I've been writing a book for Random House's Potter Craft, still in the thick of editing, not complaining at all but I just miss sewing as I haven't made it a priority lately. I got a little burned out on sewing during the development phase of the projects for the book and still haven't been able to face my insanely messy sewing room. So I love, love, love seeing what others have been doing with the collection. 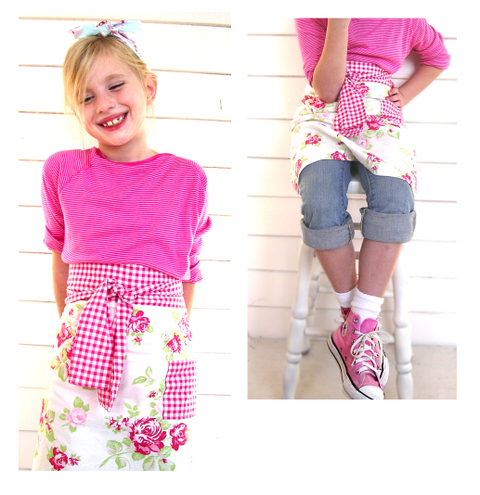 I love this little reversible jacket from Randi of Fresh Squeezed Fabrics and her blog I Have to Say. The red buttons are killing me! Melissa over at 100 Billion Stars also has a really cute Valentines Day tutorial using Delilah. Thank you so much for your emails in response to the last post!! I can't tell you how grateful I am to have so many talented people interested in helping me. I'm looking over all of them carefully and gratefully. Thank you so much again to all who responded. Wanted: dependable, committed person to help me in substantial upcoming project that I can't be specific about just yet. Must be able to sew, write clear, concise directions for sewing patterns and be able to illustrate, by hand or computer, steps for such patterns. Great opportunity to have your name attached to a project that will have visibility. Please email me tanya@grandrevivaldesign.com if you're interested but only if you're serious, have the time, and can do the work outlined. Please let me know in your email what kind of experience and/or skills you can bring to this project. I'm looking forward to hearing from you!!! l'Aiguille en Fete! 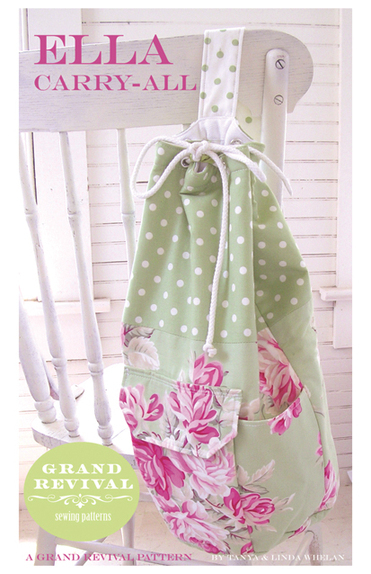 Come sew with me! Come sew with me in Paris! Or just come by and say hi. Met so many lovely, cool shop owners and young entrepreneurs at the trade show last weekend in the Netherlands. My favorite part of these things is meeting people who are passionate about sewing and creativity in general and to hear what their up to. Hope you'll stop by this Thursday, Friday, Saturday and Sunday for 4 free workshops daily where you'll sew the Metro Bag with me. I hope to see you there!! Coffee and crocheting, two of my favorite things. I'd forgotten how much I love to crochet, I used to do it all the time. The best thing about it is just how portable it is. I can take my yarn and hook anywhere and just start creating. Ava and I are making an afghan together with this gorgeous cotton yarn. I love it because although I love to sew with her, I'm always really nervous that the needle is going to pass right through one of her little fingers so I'm always right on top of her if she's using the sewing machine. With this we can sit together and crochet while watching TV and relax and when I leave the room I'm not petrified of hearing her little self screaming in pain. My rediscovery of the joy of crochet coincides nicely with what I've got coming up in the next few months. I'll be traveling around Europe to trade and consumer shows to talk about my collections and show project ideas for what to do with my fabrics so it's nice to have something to do in the hotel room. Last weekend I went to Le Smak, a big crafts trade show in Paris to do a couple of workshops with shop owners. Very fun and very interesting. My speech quickly turned into a lively discussion group with these wonderful women which I enjoyed so much more. February 7th I'll be in the Netherlands with the Coats and Clark sales team there at KreavaK a trade show in Arnhem in the Netherlands for meeting, greeting, chatting, and with free patterns in hand. Back to Paris the next week for 4 days at L'aiguille-en-fete for sewing demonstrations of one of my bag patterns where consumers can sit down and sew their own bag with me, just want to show, especially novice sewers how easy and quick it is. Then a couple of trips to Germany in March for some exciting things I'll share later. Free Spirit Fabrics have only been distributed by Coats and Clark in Europe for about 18 months so I'm just helping to get the word out here. Along those lines, I just found out that my lines are now being carried in the UK at hobbycraft where you can buy Darla on-line and in stores and at John Lewis stores which I'm really excited about. I'm so proud of my mom! She opened her Etsy Store Xmas Muse again this year. I love her stockings, just so sweet and nostalgic. But even more exciting, she did an article for Romantic Homes magazine about how to make one of her pretty hanky stockings and her stockings ended up making the cover!!!!! So cool, and she was nice enough to use my fabrics from Darla and Ava Rose for the cover stockings,thank you mom! Anyway, check out her handmade goodies if you have a chance or pick up the December issue of Romantic Homes to learn how to make a hanky stocking of your own. Slowly getting the downloadable patterns up and ready to go. Thank you so much for the warm welcome the Monterey Market Bag has received so far!!! I had a feeling there was a want out there for patterns you could get your hands on immediately. You know, sometimes you just need to make something right now! Here's the newest, the Metro Bag, ready to go. Easy, reversible, roomy. I love the shape on this one and the way it hangs. It's got cute pleats at the top that give it a nice detailed look. Hope you like it!! 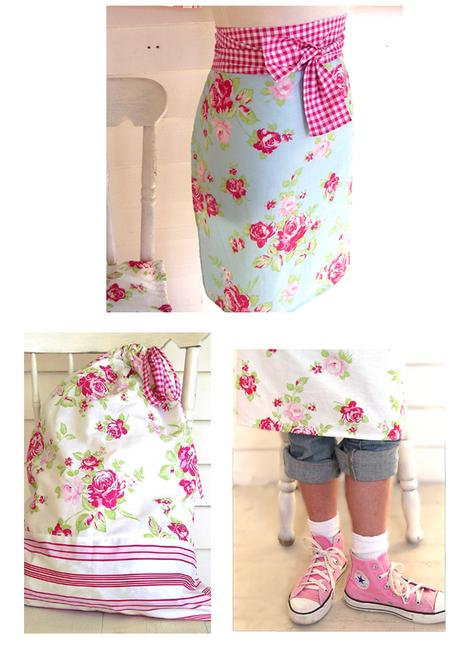 Many more downloadable patterns to come, one at a time, slow and steady. Husband is getting some hardware out of his leg from his freak beach accident last summer that left him with a mangled leg so I wanted to get this up before all extra time is spent waiting on his cute self hand and foot. Hey, did you go to market?? How was it? Found myself wishing I had attended. So much beauty and inspiration was to be found this time from the pics I've seen. Thank you Sunni! Please contact ljanewhelan@gmail.com to receive your patterns. We'll send out your Fat Quarter Shop fat quarter pack as soon as they get them in November. Thank you so much to all who entered. Over 600 this time which blew me away. You have no idea how much it means to read such incredibly kind things about my work. That sounds like a platitude but trust me, it ain't!!! It makes everything I do worthwhile, truly and it just touches me plain and simple. THANK YOU!!!!!! Well, yeah launch feels like too strong a term to use here but it's a mini launch at least with much more to come. I've been wanting to start an on-line store of sorts with some sewn goods and some and (here comes the launch) some downloadable patterns for sale. I've been busy with the moving to Belgium thing so I figured I'll start small with a really easy, fast and cute pattern. It's the Monterey Market Bag, that's the first one now available for immediate gratification, got that creative itch, but don't know what to make download. Why call it the Monterey Market Bag you may ask (you're probably not asking but I'll tell you anyway). When I used to live in Monterey California and Santa Cruz Cali too, they had these weekly farmer's markets filled with all kinds of beautiful produce and handmade goods for sale. There would always be a couple of booths filled with slouchy, simple, pretty, practically sized, bags made from leftover upholstery and other fabric, Indian saris, etc. The bags had a cool hippy vibe, cause they were made by cool, hippie women for the most part. And they always tempted me. This bag reminds me of those, totally simple, slouchy, would look great with leftover scraps, and you can make a bunch of em quickly if you want to make some quick presents. Well, I hope you like it and we'll have another downloadable bag to introduce real soon and I promise to pick the winner of the giveaway in the next few days, I really promise!! And so it begins, the week long sewing extravaganza for Fall Quilt Market. Though, I think I only have about 5 days left before I really need to get samples in the mail. I'll share some more of my labor of love soon....Oh, and I think a give-away of some Dolce is definitely in order very soon. I really cannot wait for the first issue to hit news stands!!! As this magazine will be produced by actual style editors (ie the creative forces behind our favorite magazines and ideas) as opposed to giant publishing houses I'm really looking forward to seeing their ideas come through in the pages of this new magazine. There was a time when magazine stories had budgets...when there was actually money for fresh flowers and props and last minute items, and when graphic designers and writers and stylists were just simply part of the whole package. "Those were the good old days" as folks say and for Flea Market Style we are literally flying without a net. It is good in some ways: we are forced to look at design with realistic boundaries. No trips into New York to attend trendy design shows or vetting our ideas through high end dealers who are trying to show off their wares in the glossy pages of a magazine. Our tips and ideas, as well as the items we are using to prop and decorate with, come from a place accessible to everyone. It is stuff you will find at the flea market because that's really where we found it. Our style and design is real because we are real. So, terrible pictures I know (getting a better camera in the mail soon!! I hope) but this is our new home for a long while anyway. It was not easy to get here. We found what we thought was the perfect rental house for us, late 19th century, 15 foot ceilings, ornate moldings, marble fireplaces, everything painted white, very well worn and a bit shabby, just how I like a house. What we didn't know was that the smell that pervaded the house was not something that would go away with some bleach and a good airing. It had a terrible mold, mildew problem, not uncommon here I've since found out (there is no air conditioning anywhere and it rains alot, go figure), and we had to move out after 2 nights. It was sort of a difficult time, worried we had made a huge mistake, etc. But, even then, I knew in the scheme of things it was not that big a deal. We found this house, it smelled good, though sort of like a grandma (I love grandmas and their smells don't get me wrong, but after the last disaster I'm just very cognisent of smells) but it took me a while to warm up to it. I love old houses, I love the old house we still have in the states, so much in fact we decided not to sell it but to rent it out, but I had to get used to the darkness of the living room and all the color of the painted ceilings, wallpaper and tile floors. I'm just used to white and light so I'm adjusting, I'm really digging it now that I'm thinking of the living room more like a library, I feel really kind of a warm embrace when I'm sitting in there reading a book at night. I'm starting to understand the darkness of Victorian interiors I think. The house is definitely calling out for some treasures from the Paris flea market though (just 2.5 hours away) and I'll just have to oblige I think. Finally getting settled here, a slightly painful process I'll tell you about later...All is very well now and just a quick note to let anyone interested know that Fat Quarter Shop has made Dolce available for pre-order. Jocelyn tells me they are already getting requests for it which makes me very happy indeed. The collection represents a slightly different direction for me so I'm glad people are liking it. As soon as I can find my sewing machine I'll be blogging about projects made from Dolce as well as a new bag pattern we're introducing with what I hope you'll think is a cool twist. OK, enough of that un-crafty stuff from the last post!! But before we get onto other things, may I just say, I LOVE YOU!!!! you totally wonderful people who wrote such lovely supportive things in the last post!! That silliness hurt my feelings so I'm just grateful to you who commented for throwing some love my way when I needed it. With that behind us, this will probably be my last post for a little while cause I'm moving in 4 days!!! Can not wait. Trying to learn French, pack, finish re-working strikeoffs for my next collection, it's crazy here but very happy. 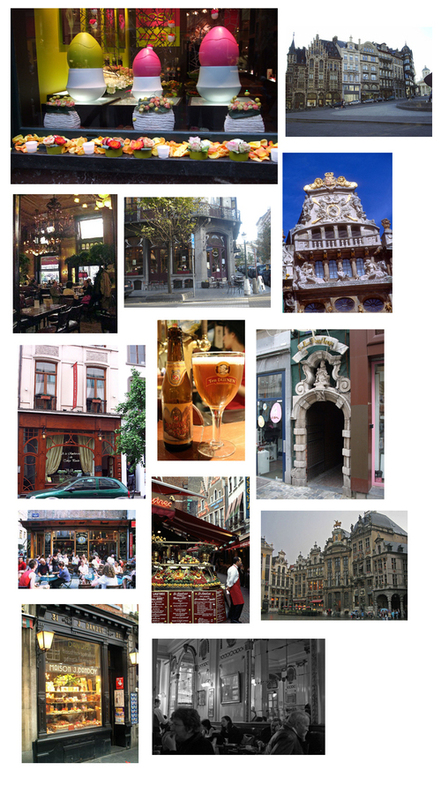 Next time I'll be blogging from BELGIUM!!!!! So excited for this next chapter. Got the July Martha Stewart Living in the mail this week and got to see our Practical Bag Pattern right there in the pages of the magazine (in the Briefing section, pg. 30) I've been reading since it began all those years ago. Amazing, amazing feeling to see that because, ya know, I love Martha. She's an icon, I grew up with her, I've learned from her, and I have enormous respect for what she's done as a business woman. "Gee, does that mean you voted for that usurper who is not qualified to be President? And now that he illegitimately sits in that office he is selling us all down the river. Hope you're enjoying The Change. And now we'll all watch as our country goes down for good." After trying to respond to her via email (it bounced back three times) I ended up deleting the comment which I have never done before. "Oh, so you only publish comments favorable to you. You delete anything that disagrees with your views. I'll be sure to avoid buying your wares." "Well, you are on the ball, at least when it comes to erasing any negative comments. Be sure I'll spread the word in my quilt groups." I want to sincerely apologize to Lucinda. Deleting the post was the wrong thing to do. I felt frustrated that I wasn't able email her and because I felt she must have fundamentally misunderstood the post I didn't feel comfortable with what I perceived to be a negative comment. But I'd like to respond. I'm not at all sure why Lucinda assumed she knew my beliefs. I am private about these things, I think there's a good reason for the secret ballot. I think and hope that my comment did not give any clue at all to which side I come down on politically. I don't talk about politics here and don't talk about it in general because I have found that it can so often lead to negative feelings that impact relationships that I care about. What I was honestly and truly trying to say is that no matter what our political beliefs or who we vote for we usually have much more important things in common then we do differences. We love our families and we care about our communities, at least every one I know whether they are right, left, Republican or Democrat cares about these things. I KNOW this to be true because I have friends and relatives on all sides of the political spectrum who I LOVE and who love me, people who I know I could count on and people who I would help if they needed it. Basically, I was trying to say we are all Americans. Sorry, that's just what I believe and I certainly didn't mean to offend anyone with that thought. I'm sorry, but I just can't and won't be angry with people who might have different beliefs then me. I'd spend alot of time being angry and I'd rather spend my time loving and caring for friends and family and neighbors (sometimes being angry at them but usually about petty stuff which is more fun to be angry about). Hope I haven't offended anyone and I feel great respect for anyone who has passionate beliefs, I have them myself and I act on them privately in the voting booth. PS Lucinda, again, I don't mean to offend you by saying this and I'm sorry if I had a negative impact on your mood today, cause honestly I get alot more joy out of having a positive impact on people but...you really cannot assume you know my politics because I have not told you what they are and you don't know me. What you can assume and what I will share with you is that I have utter and complete confidence in my country and in what I consider the nearly perfect system of checks and balances set forth in our beautiful constitution by our founding fathers. I'm a geek and I sometimes read the constitution for fun. Was just reading it the other night as a matter of fact. Maybe that's why I don't get too upset about politics. I believe that our system of government as laid out in the constitution ultimately protects us from bad governence or at least checks it at some point and that elections are part of that. The only thing you can assume about my political beliefs is that I truly love my country, our constitution and the ideals it stands for. Well, you all helped me sooo much. I just finished up Darla Too!!! Thanks to you I decided to design Darla Too which will come out fall 09' and then follow it up with a more romantic collection called Petal to be released spring 10'. That way I didn't have to choose between the two impulses. I just couldn't get Darla out of my system, and it seems many of you agreed (thank you so much you sweet, sweet people!) so I used and reworked some of the patterns from Darla One and added fresh patterns that evoke the same feeling. Changed my mind while putting it together like a thousand times but it's done and I'm thrilled. Now I can concentrate on making pretties and samples with French Hatbox which is coming out at Spring Market in May. I don't love these pictures of it, just haven't been able to get any pics I love of it, I'll keep workin on it... The collection does have a sort of un-abashedly feminine feel that brought to mind Sophia Coppola's Marie Antoinette. I could and have watched that movie with the sound off, it's so incredibly beautiful. Next I'll be fixing up all the little things that need it as we begin the process of showing our house to potential renters. I'm just wondering how I'm gonna be able to keep this place in show worthy condition from now until we rent it. Ugh! Ok, now for the important part, The winner of the pattern giveaway is Rachael!!! Living in a big city and being surrounded by chaos and noise on a regular basis I'd find myself craving a quiet spot and a stack of magazines featuring countryside cottages and seashore homes. In my teens I could spend an afternoon in the walk in closet in my bedroom that I'd papered to look like it was sprung from the pages of one of those magazines. The clothes were soon kicked out of this little closet and I brought in a small bookcase and a reading chair. I'd spend hours at a time looking at photos of antiqued bedframes bedecked with softly colored linens and pillows bursting out of floral pillowcases... completely immersing myself so the noise from the street didn't even register in my head. When I first saw Barefoot Roses it took me back to those afternoons in my chic closet dreaming of country life and beauty everywhere- my initial response was THAT IS IT-- those are the colors, the patterns, the complete embodiment of the style and design I've been craving. It's been almost 10 years since I've sat in that closet- 10 years of commutes, noise, chaos, and promises to do something nice for myself to encourage a little relaxing "me" time. Barefoot Roses gave me the inspiration to create a bedroom and bathroom inspiried by the magazines I craved (and still do). I wake up every morning to soft but bright colors, clean lines, meandering florals, and sweet dots. It brings me back to my center and inspires me to take a little time to remember what I love in life instead of plowing through it. Rachael, please email Linda at ljanewhelan@gmail.com as she handles the patterns. Are you getting that holiday feeling yet? I'm just starting to, having just put a bunch of work behind me including a new collection called Lulu and Delilah. I now feel that I can fully embrace and enjoy this wonderful time of year. A nice way to start it out was to see this whilst in the supermarket checkout line over the weekend. Jennifer had told me she saw it but I hadn't gotten my subscription copy. I wanted to tell the lady in back of me, hey look there's my fabric on the cover of Country Home, but I decided to hold back and avoid an uncomfortable moment. Matthew Mead styled up a beautiful, crisp, red and green holiday 6 page pictorial spread of my fabrics made into all manner of Christmasy craft goodness. That color green on the walls is just killing me, I love it!! We had originally discussed doing the shoot at my house but it didn't happen for various reasons and I was kind of relieved and there's no way the final result could have been any prettier then this so I'm very happy. Matthew's a genius designer, stylist, author and photographer so of course I knew the story would be great but oh how beautiful it turned out to be. Check out more Matthew goodness here and his blog. And check out the Country Home website where I think there are more pics from the story but they weren't coming up when I looked at it. There's so much other great Christmas inspiration in this issue so it's well worth picking it up. In Entertaining Simple, lifestyle and entertaining guru Matthew Mead shows you how to say goodbye to party jitters and say hello to stylish, easygoing gatherings. He gives you everything you need for parties that are wonderfully simple--and simply wonderful. Packed with beautiful color photographs, this great guide gives you innovative ideas, tasty recipes, and complete game plans for all kinds of get-togethers. To demonstrate how to put his simple entertaining ideas into practice, Matthew gives you complete plans for eight fabulous get-togethers and he provides creative serving ideas and tempting menus for each party. Oh and I found out that one of my Christmas projects from last year will be featured on HGTV on a show called 25 Great Holiday Ideas airing Friday November 28th at 9pm. I think just a photo will be shown but still thought it was neat. Talk to you soon. Happy almost Thanksgiving! Wishing you peace and love!!! Now, everyone go and vote your conscious on Tuesday!!!!! So, I've sewin up a storm. All the goodies will be shipped off to Houston for Fall Quilt Market. If you're there and you have a chance go checkout Darla at the Free Spirit booth. I mean I'd hate to have sewn up all this stuff and not have anyone see it...The patchwork baby blankets were especially fun to make and quick! Did you happen to notice the bed in the top picture. You might remember this bed drama. I ended up giving in and actually buying a brand new old style iron bed. We're moving in the spring so I had to be realistic and get something for Ava that wouldn't break during the move. The other one is sitting in my garage, poor thing. I'll probably drop it back off at Alvin's so somebody else might take it home and give it the love it deserves. Oh, got a great review over at Sew Mama Sew blog for the Ella Carry All (they carry all our patterns, yeah, thanks Kristin!). Always makes me breath a sigh of relief because although my mother and I edit and re-edit and check a million time for mistakes, it's just good to have someone else confirm that the pattern works and is easy to understand. Well, I've been busy...that's for sure. Like everyone else in the world I guess, I mean I don't know anybody who isn't ridiculously busy these days. Was it always this way? Been having some fun in the midst of the craziness (patterns shipping, Darla samples to sew, 2 other collections to finish by the deadline) though. Just got my sample yardage of Darla so I've been sewin up a storm. It really is my favorite part of this thing. It's weird though because when I first take the fabric out of the box I always think, "oh no, I've made a huge mistake...this, this and this should be different". But as soon as start sewing I start falling in love. It happened again, I love my girl Darla. Taking pics of Ava decked out in Darla today was so fun and reminded why the really busy pace right now is worth it. I mean, it feels weird to admit, but fabric makes me just stupidly happy. Patterns have been selling incredibly well so thank you so much to everyone who's bought them for themselves or their store. I just really mean thank you from my heart as it means the hard work is paying off and hopefully the things I design are making other people happy. I've missed blogging, haven't even been reading my favorite blogs which I really miss but I have been seriously bogged down. So busy in fact that I had to turn down an incredibly exciting and flattering opportunity, a book. I never thought I would turn down such a thing, I mean jeez a book with my name on it, crazy. But it wasn't the exact right project at the exact right time so I had to be mature (no easy feat for me) and turn it down. Hopefully, the right book project at the right time will present itself because I'd love to do it. But I am excited about some other upcoming things. Got to work with Matthew Mead, the amazing, incredibly talented stylist and author for a Christmas shoot in Country Home. Matthew is a complete genius in my opinion and also a completely lovely person. I'll post pics of it as soon as I get the magazine.